John Windle Antiquarian Bookseller has issued Catalogue 67. 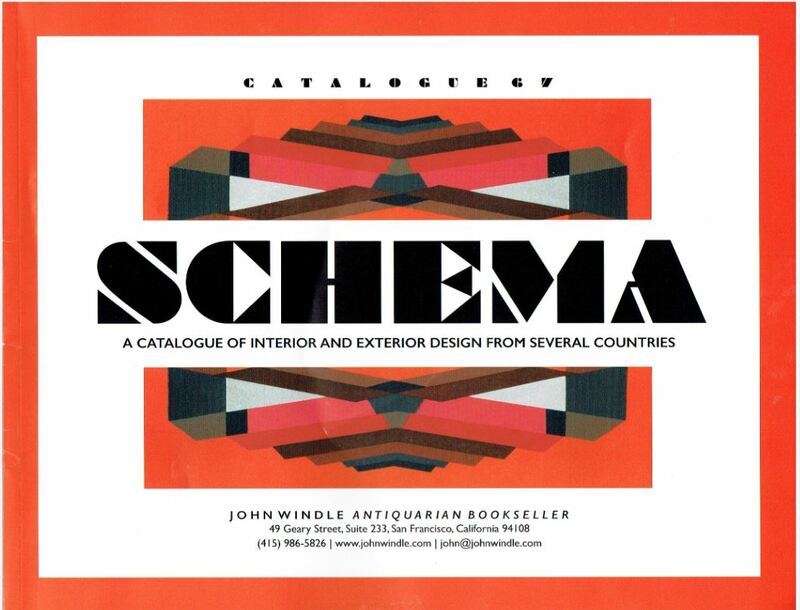 Schema, A Catalogue of Interior and Exterior Design from Several Countries. Specifically, those several countries are France, Germany, Switzerland, Austria, England, America, and Spain. France and Germany are particularly well-represented. The books offered cover a variety of subjects of interior and exterior design, including numerous sample books and plans. The era for most are late 19th and early 20th century. There is much in the way of "modern" designs and Art Nouveau, bright colors and dazzling patterns were obviously quite popular in the day. Off-white walls, such as your real estate broker recommends, were clearly not in vogue. Excitement was more the word. Wallpaper must have been highly favored as that is the focus of many of the sample books. Other subjects covered include fabrics, furniture, landscape design, architecture, sculpture, drapery, brickwork, lighting, ironwork, seating, paint, carpeting, stencil designs, and linoleum. Linoleum had a better image in that time. Other books are more focused on designs and colors than on specific objects. Here are a few samples of these sample and other books. We begin with a very large French wallpaper sample album, labeled C.P.P. Paris. It was offered by a wallpaper distributor and contains samples available through December 1929. Most have floral or botanical designs, wallflowers so to speak. There are friezes and tapestry patterns as well. Hundreds of the samples are full-page and in color. While the sample book was obviously not inexpensive to produce, the prices within were not too expensive, wallpapers in the reach of a middle class homeowner. Item 2. Priced at $8,000. For middle class Americans looking for wallpaper, this would likely have been the most popular book. It contains printed samples from Sears, Roebuck and Co. in 1925. In 1925, Sears stores would have been the Walmart of the day, its catalogue the Amazon. Hard to believe as we await the venerable American retailer's final curtain. Floral patterns were the rage on both sides of the Atlantic at the time, and I'll bet many of you remember such patterns on the walls of your grandmother's home. It coming from Sears, the sample book naturally has a practical orientation. It includes instructions on hanging wallpaper and advertisements for tools and supplies you could also buy from Sears. Item 71. $350. Rudolph Siebeck was a mid-19th century horticulturalist and landscape designer who spent most of his career in Leipzig, Germany, and Vienna, Austria. In Leipzig, he ran all of the city's gardens. In the later stages of his career, he was the city gardener and then ran all of the green areas owned by Vienna. Along the way, he wrote numerous books in his field. Item 60 is Atlas zur bildenden Gartenkunst in ihren modernen Formen (Gardening Atlas in Modern Forms), published in 1860. It includes hand-colored illustrations of Siebeck's landscape designs, 17 plates, the final one being a large fold-out consisting of four sheets. $2,750. Next up we have a portfolio from the Bauhaus or Modernist school in Germany circa 1929. The title is Farbige Raume und Bauten (Color Space and Design), the work of the serious design professor Wilhelm Joker. It is a portfolio including 30 color plates of room designs. The school focused on functionality, but not in a cold, drab sense. It also featured artistic appearances, and so these designs are also filled with vibrant colors and patterns. The book was intended for architects and room designers, as well as teachers and students in professional schools. Item 41. $1,100. Item 61 consists of the two series, 1907-1909, of Neue farbige Vorlagen fur die Textil-Industrie (New colored templates for the textile industry), edited by Christian Stoll. The two series combined hold 48 color lithograph plates. Each plate has between one and eight brightly colored images of textile patterns. Windle describes them as "inspired by natural forms such as the curved lines of plants and flowers, many hint at the later art deco style with bold and luxurious geometric designs." These art nouveau plates display intricate and colorful designs, quite artistic and beautiful. $3,000. This item comes from Compagnie Francaise du Linoléum Nairn. Linoléum Imprimé Qualité. It probably doesn't require a knowledge of French to understand this is from the French branch of the Nairn Linoleum Company, promoting quality linoleum. The company goes back to mid-19th century Scotland, where Michael Nairn went into the flooring business. With the development of linoleum, he found a successful business. Nairn merged with Congoleum years ago and now you know where the "oleum" in their name comes from. This is a trade catalogue containing 78 linoleum samples. "A dizzying compilation of French floor coverings of the period varying from art deco to mosaic patterns, and many meant to imitate tapestries," Windle informs us. Item 4. $1,200. 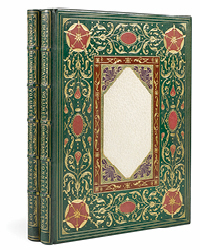 John Windle Antiquarian Bookseller may be reached at 415-986-5826 or john@johnwindle.com. Their website is www.johnwindle.com.